NGO News blog, NewsLine: ‘Jasmine cultivation’ –bags two Manimegalai Awards. ‘Jasmine cultivation’ –bags two Manimegalai Awards. The technically feasible, economically viable and bankable jasmine project brings wealth to the women self help groups and marginal farmers. Two women self-help groups of SEVAI in Posampatty bagged Manimegalai Cash Award of Rs.50000 from Government of Tamilnadu for the year 2010-11 for copious cultivation and marketing Jasmine varieties of Gundumalli and Jathimalli (J. grandiflorum), thanks for Marutham organic farming for timely intervention for use of vermicompost manure instead of chemical fertilizers. Gundumalli (Jasminum sambac) Jasmine is used for making garlands, bouquet, decorating hair of women and religious offerings. Another group cultivated another jasmine variety Jathimalli (J. grandiflorum), this variety one is cultivated for concrete. As the cultivation of Jasmine is labour intensive, the women groups are able to get employment opportunities other than the profits they made. Since the crop requires lots of manpower for harvesting and other operations, only small farmers are able to cultivate the crop, as this is the ideal crop for small women farmers whose land holdings are less than 1 acre. These women groups capitilised such an opportunity of Jasmine cultivation by taking bank loan under economic activity and paid back the loan on time having Return on investment is 40%, after the repayment of the bank loan.Marutham organic farming centre of SEVAI recommended the species-wise varieties such as Gundumalli (Jasminum sambac), Co-1 and Co-2 (J. Auriculatum) and Co-1 and Co-2 (J. Grandiflorum). The soil was test conducted for its fitness after reclamation of the land by SEVAI and Jasmine was cultivated in improved soil conditions of well drained rich sandy loam soils sandy loam to clay soils in ideal climatic conditions for successful cultivation in warm summer with ample water supply and sunny days. Two initial ploughs were administered for removing the weeds which is followed by digging of pits at a size of 30cm3. Each pit was applied 2 kg of vermi compost and 6 kg of Farm Yard Manure (FYM) before filling the pits. Planting was done during June-November at a spacing of 1.5m x 1.5m. First irrigation was given immediately after planting and subsequent irrigation at an interval of 7-10 days depending upon the weather conditions and soil type. As recommended by Marutham that each plant was applied with 5 kg of vermin and 2 litres of Panchakavya was applied in two split doses i.e., once after annual pruning and again during June-July. Weeding and strengthening of irrigation channels and bunds are the intercultural operations followed for jasmine cultivation. The first weeding was done 20-25 days after planting and subsequent weeding is done once in 2-3 months. Training is basically done to give the desired shape to the plant whereas; pruning is done to get the desired crop. Normally, irrigation is withheld prior to pruning and plants are pruned by removing all past season shoots including dead and diseased branches. It was done to prune the plants during the last week of November to get increased yield and quality flowers. Plant Protection was undertaken against Bud worm, blossom midge and red spider mite, the major pests of jasmine. Spraying the neembase pesticides of organic in nature to control bud worm and blossom midge was undertaken to control the red spider mite. Diseases - Nematode and root rot are the major diseases attacking the jasmine crop and that was controlled by the neem pest control spray. Flowering commences after 6 months of planting. 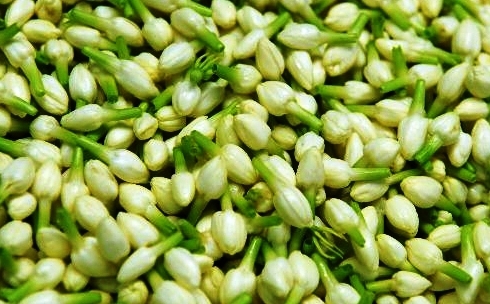 Fully developed unopened flower buds were picked in the early morning i.e., before sun rise. The flowers have a good demand in the local market as well as it is being exported to some of the South East / Middle East Asian countries from Trichy. No problems are anticipated on inputs or on marketing front. No new infrastructures were created for the activity. SHGs took up the jasmine cultivation on own land. The project cost for jasmine cultivation in three acres of land the project cost worked out Rs.30, 120.The first year after all the expences the profit they get per acre is Rs.25500 and in fourth year Rs.73, 1000.Jasmine cultivation proves to be very encouraging as far as profit is concerned and also gives employment of the women farmers those have marginal land holdings. –Etram News Service.